AFTER LISTING on the Toronto stock exchange in 2006 Nautilus Minerals became the public face of a daring new industry: deep-sea mining. It planned to pursue riches on the ocean floor, mining metals such as gold, zinc and copper, desired respectively for lustre, alloys and electronics. Robotic machines would cut, grind and gather volcanic rock at a site called Solwara 1, located 1,600 metres beneath the surface of the Bismarck Sea near Papua New Guinea (PNG). The resultant rocky slurry would be pumped up to a support vessel, then shipped to a site at which the metals could be extracted. Investors were convinced; Nautilus’s shares doubled from their initial price of C$2 ($1.80) in a few months. Today a Nautilus share is worth just a few Canadian cents. Three problems have changed sentiment. First, the firm has had substantial contractual trouble with the government of PNG, in whose territorial waters Solwara sits. The two sides wrangled for years over payments that the government owed for its equity stake in the project. The government eventually stumped up, but the row slowed progress. Second, the idea of using Nautilus’s vast machines to carve and crush underwater volcanoes does not sit well with environmental groups in PNG and around the world. That may have unnerved investors. Third, uncertainty after the financial crisis of 2008-09 made it harder for Nautilus to fund its untested venture. That has left only two big shareholders: MB Holding, an Omani conglomerate, and Metalloinvest, a Russian steel and mining firm. Timetables have slipped badly as a result. The firm states only that mining at Solwara 1 will now be delayed “past” the third quarter of 2019, with no start date offered. Meanwhile, the firm’s finances are making a descent. Some $350m is required to get mining going. Nautilus has drawn down half of a $34m credit line that MB Holding and Metalloinvest extended to it in January in exchange for the rights to purchase more shares (an arrangement which coincided with the departure of some senior managers and Nautilus’s chairperson). The company is due to start repaying these loans in January but, as of September 30th, only had $200,000 of cash. To add to these problems, Nautilus appears to have lost the specialised support vessel that it had planned to use. It had chartered a new ship through MAC Goliath, an Emirati shipowner and operator. The vessel was nearing completion at the docks of Fujian Mawei Shipbuilding in Fuzhou in southern China in December 2017 when MAC Goliath defaulted on a payment. Nautilus was given the option to step in and make the missing payment, but was unable to do so. In July the Chinese shipyard found a new firm to take over the contract, MDL Energy, an Indian shipowner that is planning to engage in deep-sea mining explorations for India’s government. Kulpreet Sahni, MDL’s chief executive, confirms that his firm now owns the ship. If the vessel is gone, that would be a huge blow for Nautilus, for it had been custom-built for the firm’s particular mining methods. It will be near-impossible to replace, especially given Nautilus’s beleaguered finances. 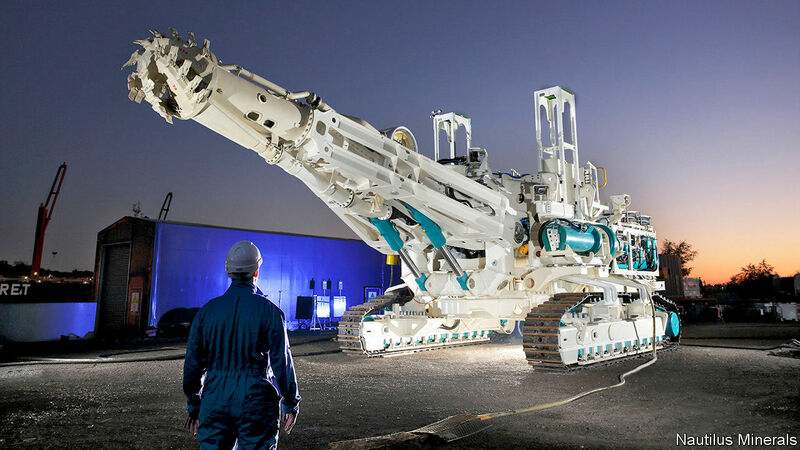 But Nautilus’s travails have offered lessons to the rest of the deep-sea mining industry. Gerard Barron, Nautilus’s first financial backer (who sold out of the company years ago), has hired some of Nautilus’s ex-employees for DeepGreen, a new deep-sea mining venture which focuses on harvesting metallic nodules that are scattered across the sea floor in the deep ocean. These contain metals such as cobalt and nickel needed for the batteries and wind turbines that power the clean economy. Having watched Nautilus’s progress, he reckons that hoovering up nodules will be easier than grinding volcanic rock, and that their uses lend such activities a more environmentally friendly sheen. Other firms have made a similar bet. Although the water in the Clarion-Clipperton Zone, a patch of Pacific sea floor in which such firms will operate, is some three times deeper than that at Solwara, the location is out on the high seas. That means it is subject to a clearer set of rules for mining and exploration which is overseen by the United Nations, thereby reducing the scope for wrangling with national governments. Nautilus holds a concession there, too. But if the firm does not secure a fresh infusion of cash, its machines may never venture further than a dock in PNG.